Today's post is coming to you from in the name of Love by Bianca Juarez. Her blog has been a huge source of encouragement in my walk since the day I first read it. It's like an everlasting, neverending Gobstopper, each post is like a layer of the candy, unique in its own way yet just as exciting and challenging as the last. May you be blessed and challenged in your walk today as you read Ordinary to Extraordinary. David was a mere shepherd boy until the day he was anointed by Samuel. From the top of his head to the tip of his toes he was covered as a providential sign of his calling. From that pivotal point on, his life was rocked. An ordinary shepherd boy began to do extraordinary things. Oh, you know, like killing beast of the fields and slaying giants. Average stuff for a teenage boy called to greatness. Deborah was part of the tribe of Israel until she was called to be a judge in the land. To painfully point out the obvious, she was a woman. But this ordinary wife was a leader, foreseer, and motivator to the masses. She lead Israel into a successful battle, when women of this time were non-entities of society. No matter the gender bifurcation or elevation, she did was God called her to do: Be extraordinary. Peter was a fisherman. No, not like Long John Silver, but like one of the Jersey Shore kids. Leathered skin, horrible accents, unwarranted swagger. Fisherman were over-looked by society, but this ordinary fisherman was chosen to be a extraordinary fisher of man. He walked on water, participated in miracles, and gave one of the best apologetic defenses of the gospel even today. When God calls us, He equips us. Each of the people mentioned relied upon the work of the Holy Spirit to fill them... to do the extraordinary. And guess what? God is still calling people to do the impossible. The question is simply, are you willing to stop living an ordinary life? 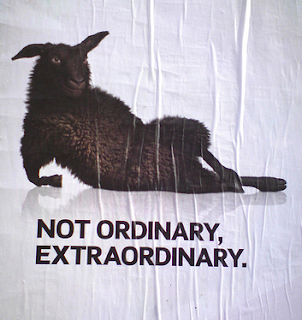 So, what's your extraordinary life? How can we live spirit-lived lives? I love how God takes what the world deems unworthy and uses it for His glory. God is continuing to humble me and this post is just another one of His tools. I love the clarity & naturalness at which you write! I think that comes out from having a heart right with the Lord because God really broke me, and the attitude I write in is a mellow voice. But I think He brought me to your blog for a reason! I've asked Him to take away all the bad parts of my sanguine nature, and believe me, I'm going through bootcamp LOL...but I believe, when we are submitted to Him, he brings out our natural character in the best way - cos its been submitted to Him!